Chamaedorea stolonifera, common name Stolon Palm, is a low growing palm to 5 or 6 feet, that suckers easily with underground runners (stolons) to create a nice clump with thin trunks. 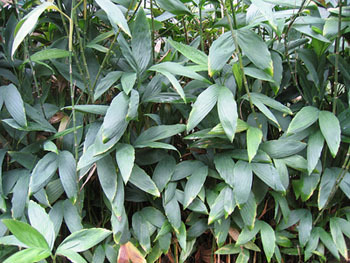 A small palm with bifid (split) leaves, that are dark green, deeply notched, with serrated edges giving a fishtail appearance. It's cold hardy to 28 degrees F. It prefers filtered light to shade. It can be propagated by dividing and replanting the rooted stems from runners. Grows best in warm, sheltered, moist well-drained soil and can be quite drought tolerant. It can be used as a house plant. Its origin is the shady, moist, limestone based rainforest in southeastern Mexico.